"Isn't the world full of wonderful things?" 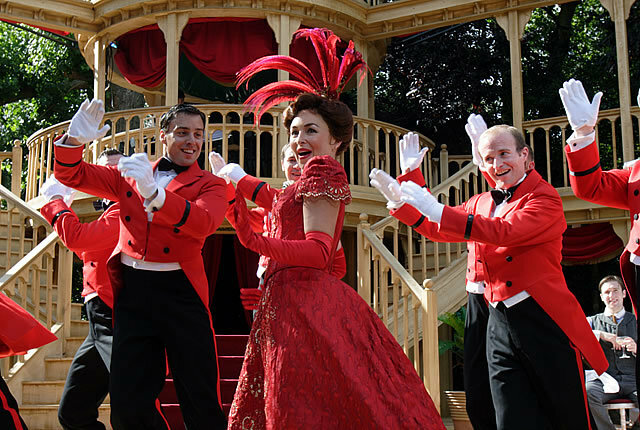 asks one of the love-struck fools in Jerry Herman's big, brash musical Hello, Dolly!, which opened at the Regent's Park Open Air Theatre last night. Well, yes. It is. Happily many of those wonderful things are on full, big-hearted love-struck display in this show. 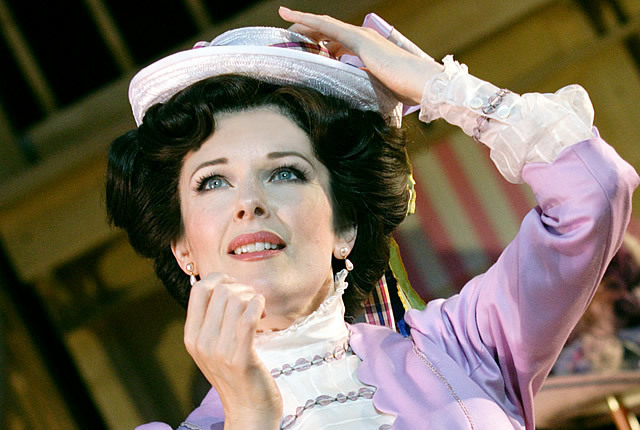 As full-on 1960s American musicals go, Hello, Dolly! must take the Golden Tap Shoe Award, with added Jazz Hands. But despite the huge Oscar-winning film version from 1969 (starring one musical legend, Barbra Streisand; directed by another, Gene Kelly), the story is a relatively simple one. Indeed, in set-up, it's almost Shakespearean. Four couples leave the relative comfort of their "homes" and head to their Forest of Arden, the excitement and bright lights of New York. On the way, helped by the meddling Puck-figure matchmaker Dolly Levi, they learn to lighten up, laugh, and of course, fall in love. 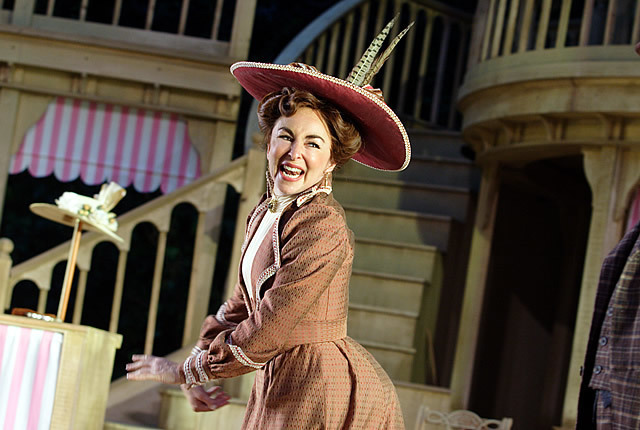 The wonderful Samantha Spiro leads the cast in Regent's Park in a production that has lots to like about it. We defy musical fans not to sit there with big grins on their faces from the start. 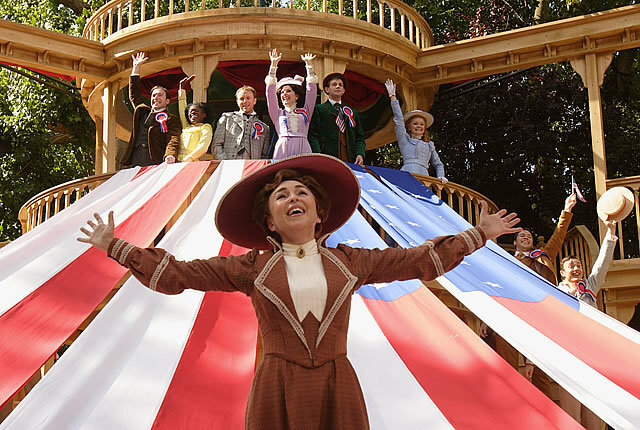 Peter McKintosh's set moves seamlessly from a bustling New York railway station, to Vandergelder's Hay and Feed Store out in sleepy Yonkers, to a posh city hat shop, to the sumptuous Harmonia Gardens Restaurant, complete with red carpet, for that all-important entrance by our eponymous heroine to the title song. As big entrances go, it's far from Samantha Spiro's first. As perfect a Dolly as you're likely to see, every time Samantha arrives on stage, it's like a big spotlight has been turned on. Spiro revels in the script's smart, sassy New York banter, as well as having the range to handle the widow Dolly's more thoughtful moments. Singing a part made legendary by none other than Barbra Streisand is never going to be easy, particularly when you add tricky outside acoustics to the mix, but despite some tired moments in the second half, and last night competing with a police helicopter, Spiro sings Dolly like the star she is. The rest of the cast more than match her. We think Josefina Gabrielle (as milliner Irene Molloy) deserves a mention, as well as the two boys playing Cornelius and Barnaby; Daniel Crossley and Oliver Brenin. 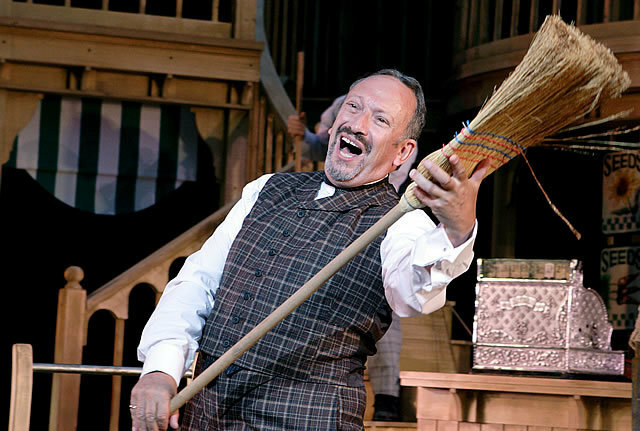 Whether in farce-mode, full-cast dance number, witty comic song, thoughtful solo or pulling the best from a sparky script, they all do brilliantly. 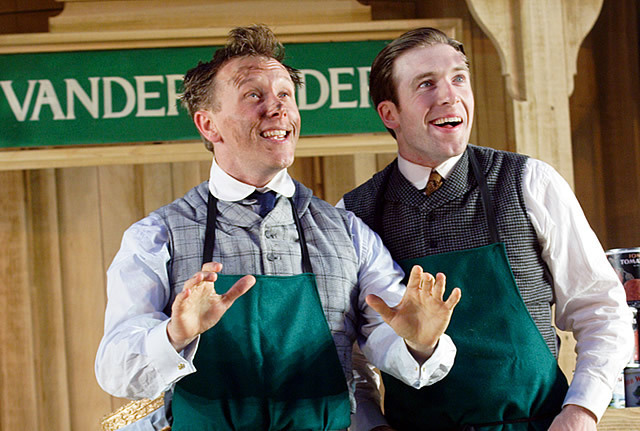 Timothy Sheader's direction is impeccable; the choreography from Stephen Mear is a joy to watch. We can't remember the last time a rain-soaked London audience broke out into applause, mid-song, for a gag as silly as a smoking stove-pipe hat. The programme notes tell us Hello, Dolly! is a fun show with no moralising. We beg to differ. As a celebration of life lived to the max; carpe diem-ing; throwing open your arms to strangers, adventures and love, we think it's as good a paean to humanity as you're likely to find. Particularly if, like us, you want one featuring tap-dancing waiters.